SARG or Search Arguments are very important for a good query, even if the predicate is very selective and supported by an index, does not guarantee that SQL Server is going to use an index. You need to write an appropriate predicate to allow the Query Optimizer to take advantage of the indexes. The Query Optimizer is not omnipotent. It can decide to use an index only when the arguments in the predicate are searchable. You have to learn how to write appropriate search arguments (SARGs). To write an appropriate SARG, you must ensure that a column that has an index on it appears in the predicate alone, not as a function parameter. SARGs must take the form of column inclusive_operator <value> or <value> inclusive_operator column. The column name is alone on one side of the expression, and the constant or calculated value appears on the other side. Inclusive operators include the operators =, >, <, =>, <=, BETWEEN, and LIKE. However, the LIKE operator is inclusive only if you do not use a wildcard % or _ at the beginning of the string you are comparing the column to. Above the query returns two rows only; therefore, the WHERE predicate is very selective. There is a nonclustered index on the orderdate column. However, SQL Server did not use the index, as you can see. The orderdate in the predicate does not appear alone; it is instead an argument of a function. You can rewrite such a query many times. The following query produces the same result, but this time the predicate is a SARG and we can see the different cost for both querys. Using the AND operator in the WHERE clause predicate means that each part of the predicate limits the result set even more than the previous part. For example, if the first condition limits a query to five rows, then the next condition connected to the first one with the logical AND operator limits the query to five rows at most. The Query Optimizer understands how the logical AND operator works, and can use appropriate indexes. However, the logical OR operator is inclusive. For example, if the first condition in a predicate would limit the query to 5 rows and the next condition connected to the first condition with the logical OR operator would limit the query to 6 rows, then the result set could have anything between 6 and 11 rows. If the two conditions use two different columns, then SQL Server conservatively takes the worst case and estimates that the query would return 11 rows. 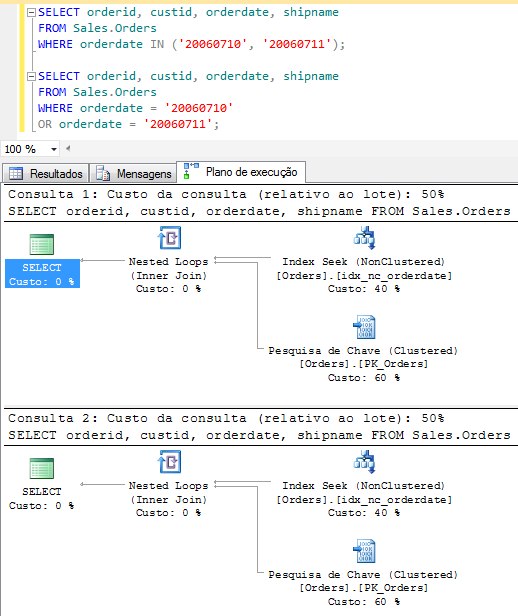 Having multiple conditions in a predicate connected with the OR operator lowers the possibility for SQL Server to use indexes. You should consider rewriting the predicate to a logically equivalent predicate that uses the AND operato. 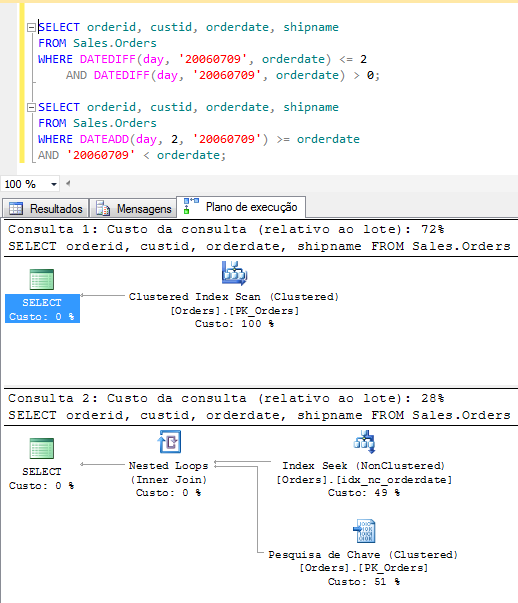 Another thing you have in mind is that SQL Server executing the IN and the OR operators in the same way. For example the following two queries return the same two rows and are internally treated as equal.